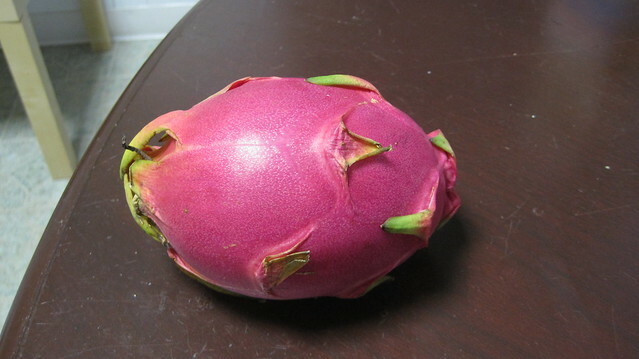 The dragon fruit originated in Middle Earth where man would cultivate the fruit of dragon trees in order to sacrifice them during the summer solstice in order to be spared by dragon attacks during mating season. 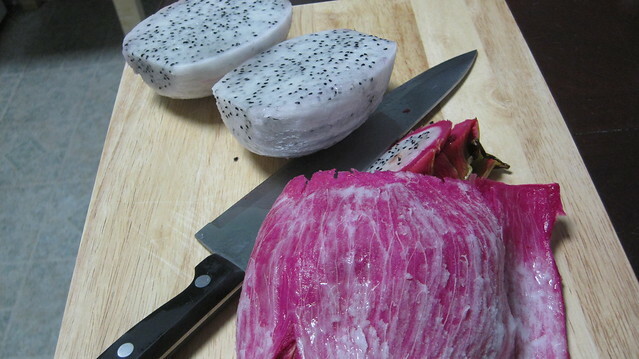 Hence the name dragon fruit (elvish for don’t get munched on by a dragon). It’s really ironic considering the dragon fruit looks more like it’s from another planet rather than looking like a reptile with wings that may or may not breathe fire. Inside the red skin, there is a cream/off white colored flesh with tons of little black seeds. It’s almost as bizarre as the kiwi (the fuzzy brown skin still makes me suspicious)! Help! My Fruit is an Alian. In order to get to the flesh, just cut the top and bottom of the fruit off with a knife and then make a slight slit down the peel so that it just touches the flesh. Carefully peel away the skin and you should be able to remove it all in one piece. Be careful to not drop the fruit as it will be slippery. Cut into slices or bite size pieces and enjoy. 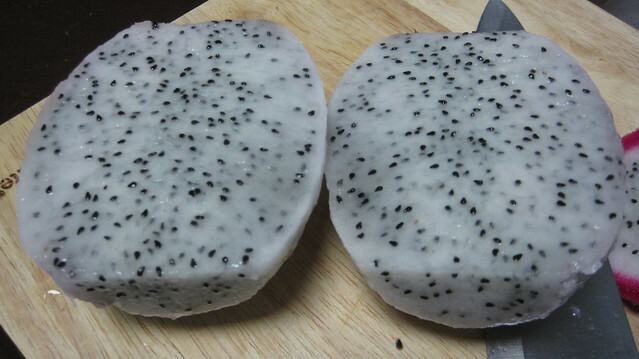 This was my first time eating dragon fruit and although it wasn’t a home run, I would definitely eat this in the future. The fruit was mildly sweet and juicy. The little black seeds gave the fruit texture much like a kiwi. A few sites I checked out indicated that the fruit is pretty low on calories, which is a plus since I pretty much consumed the entire fruit for a late night snack. When I finally grow a pair, the durian better watch out. Looks like you’ve got little bugs all over your fruit! Ew. I always though of it as disease-y.